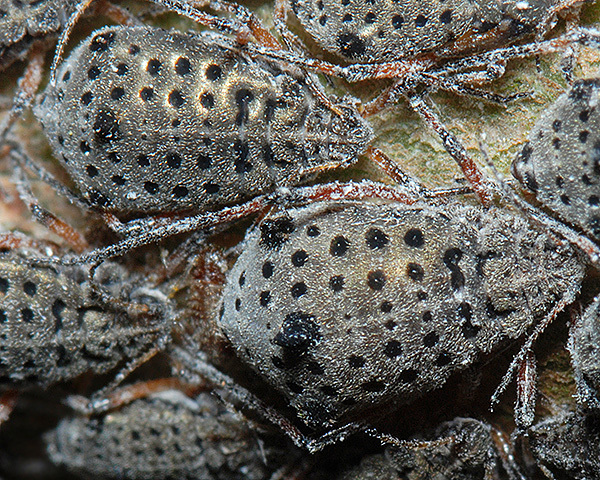 Tuberolachnus are large aphids, whose adults may be winged or wingless. They have a single large tubercle on the back of the fourth abdominal tergite (just in front of the siphunculi). The siphunculi are on large dark cones. The antennae are about half the body length. Tuberolachnus is a small genus with only three species of aphids, two of which are only found in the Far East (subgenus Tuberolachniella). The remaining species, Tuberolachnus salignus, is cosmopolitan and feeds on willows (Salicaceae). It does not host alternate and does not appear to have a sexual stage in the life cycle. It may be ant attended. Apterae are mid-brown to dark brown with several rows of black sclerotic patches. The body is covered with numerous fine hairs (see first picture below), which give a greyish-golden sheen to the abdomen. There is a large dark brown tubercle in the centre of the back, just in front of the siphunculi which are on large dark cones. The antennae are less than half the body length. Tuberolachnus salignus are very large aphids with a body length of 5.0-5.8 mm. Unlike Lachnus aphids (to which it is closely related), alates have the forewing membrane unpigmented. The pterostigma and costal margin are dark brown. 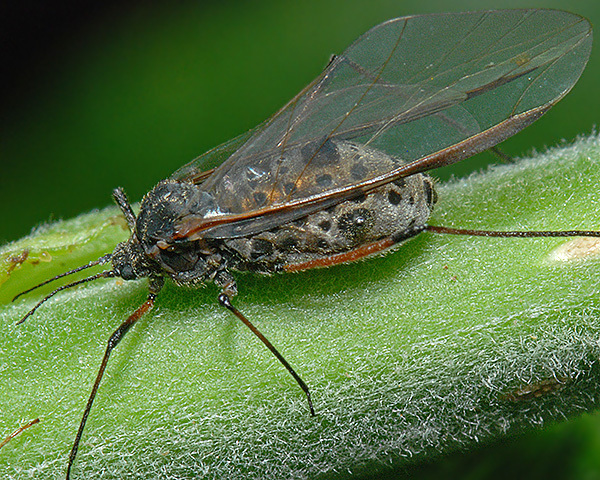 The giant willow aphid lives on the stems and branches of numerous willows & sallows (Salix spp.) and is also very occasionally recorded from poplar (Populus). Its distribution is almost cosmopolitan wherever willows are grown.